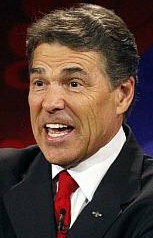 Obamacare Opponent Rick Perry Lobbies For $100M In Obamacare Funding - Joe.My.God. Perry has been a heated opponent of the health law. He refused to accept $100 billion in federal funding to expand Texas’ Medicaid program under Obamacare, which could have helped 1.5 million poor Texans afford basic health benefits. As recently as April, Perry essentially called the expansion a joke. “Seems to me April Fool’s Day is the perfect day to discuss something as foolish as Medicaid expansion, and to remind everyone that Texas will not be held hostage by the Obama administration’s attempt to force us into the fool’s errand of adding more than a million Texans to a broken system,” said Perry. Now, Perry is seeking federal dollars for Texas’ Medicaid program anyway. Politico posits that it is “less politically charged” in Texas to ask for this Obamacare money, since it’s only being done on behalf of the elderly and the disabled. And not, you know, for the rest of them poor people without health insurance.